"American public attention rarely remains sharply focused on any one domestic issue for very long -- even if it involves a continuing problem of crucial importance to society." So wrote the economist Anthony Downs in 1972. He described the "issue-attention cycle": "Each of these problems suddenly leaps into prominence, remains there for a short time and then -- though still largely unresolved -- gradually fades from the center of public attention." Three months after the earthquake in Haiti, it is clear that it's not only domestic problems that receive this kind of attention. 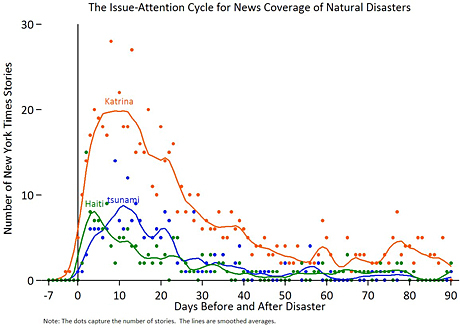 Indeed, a comparison of New York Times stories about three recent natural disasters -- Hurricane Katrina, the 2004 Indonesian tsunami, and the earthquake in Haiti -- shows that the issue-attention cycle characterizes news coverage of each. The graph below begins seven days before each disaster and continues for 90 days thereafter. With the exception of Hurricane Katrina, which garnered a few stories as it approached the Gulf Coast, coverage began in earnest right after each disaster struck. In each case, it then quickly reached a peak (which is, unsurprisingly, highest for Katrina, the lone domestic disaster) before quickly declining. In the case of Haiti, it declined to a trickle, with perhaps one story a day. These cases match Downs' account well. He described how the cycle begins with an "alarmed discovery" of a problem that had long existed. Of course, natural disasters are by their nature sudden, but the problems they illuminate -- vulnerable levees, dire poverty, weak political institutions -- are chronic. The Onion’s headline about Haiti was fitting: "Massive Earthquake Reveals Entire Island Civilization Called 'Haiti.'" "Euphoric enthusiasm" ensues, as citizens and governments muster aid. But as the "cost of significant progress" becomes clear, few people or leaders are willing to make the necessary sacrifices. There is a "gradual decline of intense public interest" -- perhaps not even gradual in these cases. And the news knows it. Not two weeks after the earthquake, CNN’s Sanjay Gupta told the New York Times: "We all know what’s going to happen. People are just going to lose interest in this as a story. They’re going to stop watching." News coverage can even help assuage people's guilt. Two weeks after the disaster, the New York Times saw "signs of revival in Haiti.” Seven weeks after that, the Dallas Morning News found "signs of normal life." Such signs may be real, but these sorts of stories aren't likely to sustain the public's interest. Sometimes, in Downs' words, the cycle begets "new institutions, programs, and policies" that "persist and often have some impact even after public attention has shifted elsewhere." This may be Haiti’s best hope, and certainly relief efforts continue. But will they prove sufficient? Obama will (and should) do something about this situation ... Yet he will have a festering situation on his hands for the rest of his term ... Obama now stands a higher chance of being a one-term President. Foreign aid programs are especially unpopular, especially relative to their small fiscal cost ... Just as it’s not easy to pull out of Iraq or Afghanistan, it won’t be easy to pull out of Haiti. But it's now clear that Haiti won't affect Obama's political future in any significant way. In part, this is because the worst fears about the earthquake's aftermath weren't realized; Haiti didn't descend to utter lawlessness. Still, it faces extraordinary challenges. The problem is that these are largely invisible in American news and thus among American voters, who are therefore less likely to hold Obama accountable for Haiti's struggles. The seeds of Haiti's irrelevance were always there, in the surge and decline of the issue-attention cycle. Maeve Carey assisted with research for this piece.